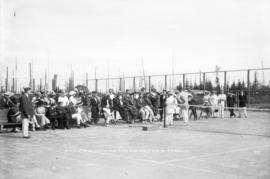 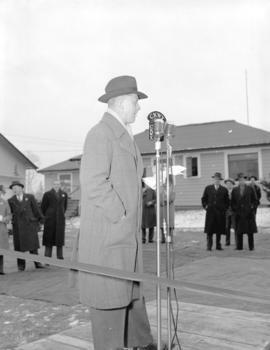 Photograph shows men and women assembled at edge of tennis court located at 41st Avenue and Laurel Street. 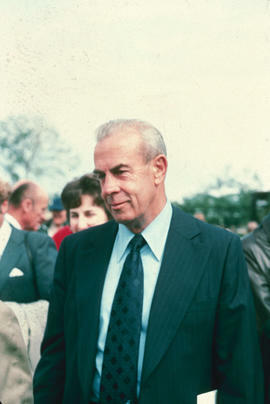 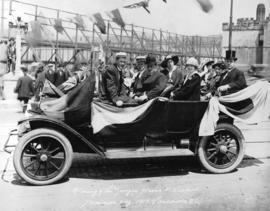 A note on the original accompanying envelope states that the photograph shows the mayor's car. 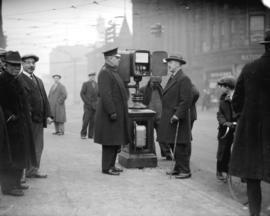 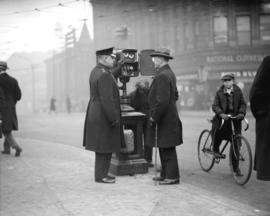 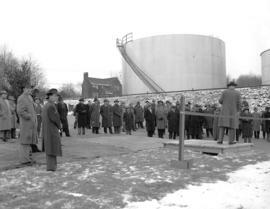 Item includes history of the development of the Centre, list of donors, film week events schedule, and seminar schedule. 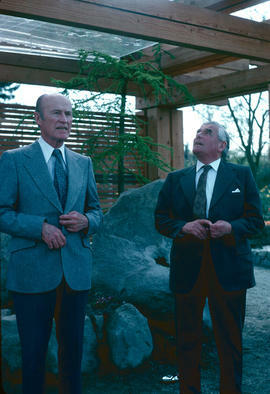 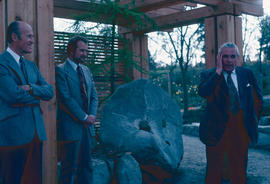 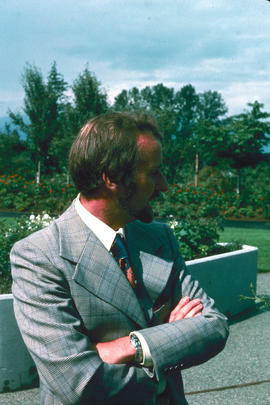 People, Botanists : VanDusen, W.J. 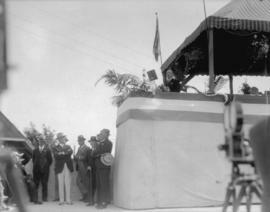 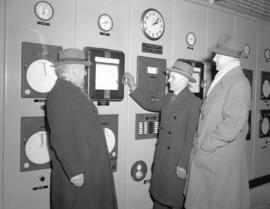 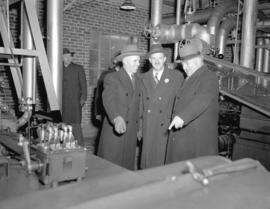 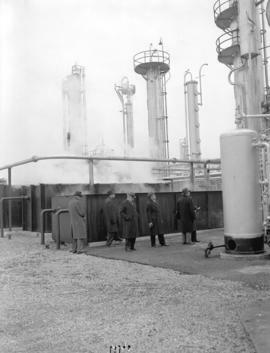 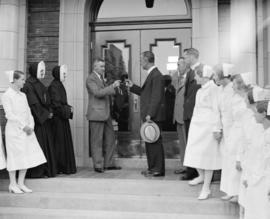 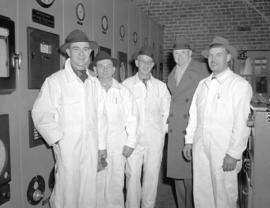 Mayor Art Phillips, Alderwoman May Brown, and Premier Dave Barrett were included in the photograph. 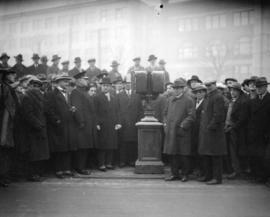 Item includes a replica of the program of the inaugural performance at the New Orpheum Theatre, November 8, 1927. 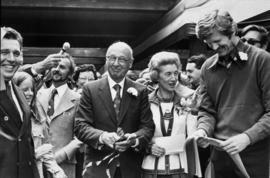 Riverview outpatient department official opening program, April 10, 1972 at 2:30 p.m. 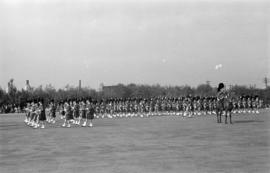 File consists of photographs (slides) of the visit of Queen Elizabeth II and Prince Philip to Vancouver in 1959. 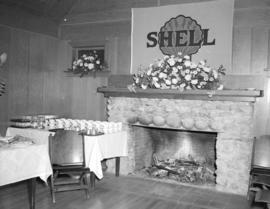 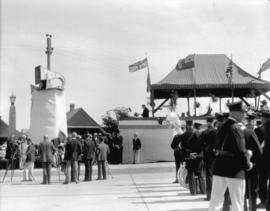 Includes photographs of the opening of the Deas Island Tunnel and the Queen Elizabeth Theatre on July 15, 1959. 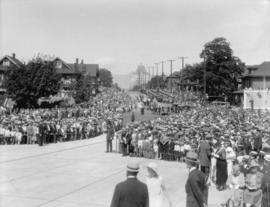 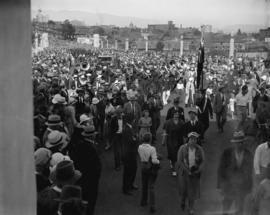 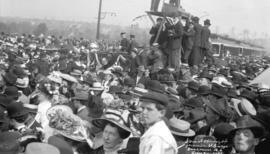 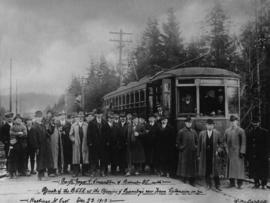 Photograph shows crowds of people and streetcar at opening ceremony. 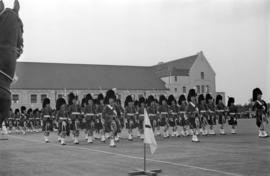 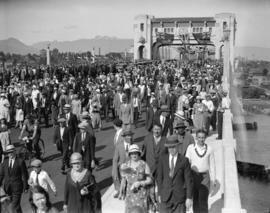 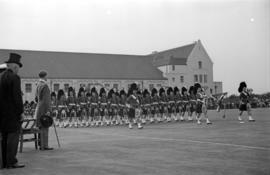 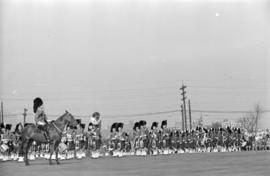 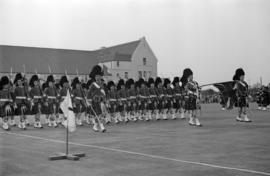 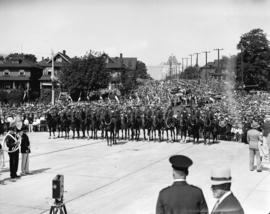 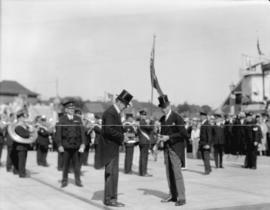 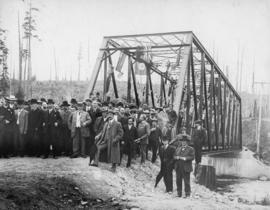 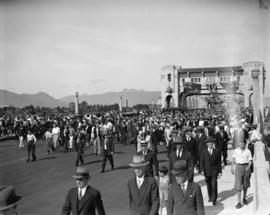 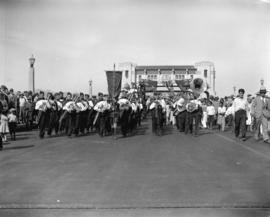 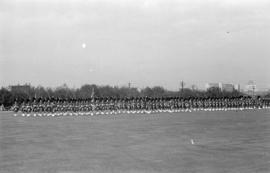 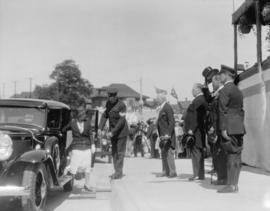 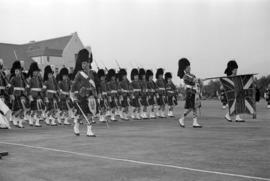 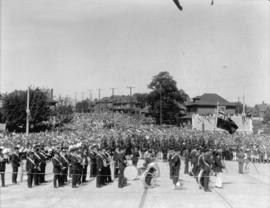 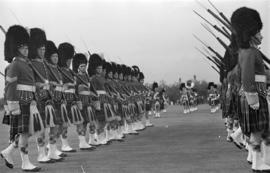 Item is a photograph of the Seaforth Highlanders marching at the opening of the Seaforth Armoury, with the Burrard Bridge in the background. 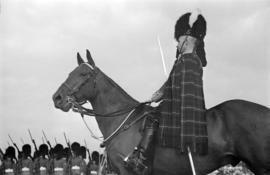 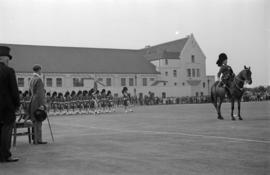 Item is a photograph depicting the Seaforth Highlanders marching, led by a man on a horse in front of John Buchan, with the Seaforth Armoury building in the background.